No matter how hard you look, it can sometimes be difficult to find shoes in a style that perfectly matches the look you're going for. But don't worry — that's where our following tricks come in. 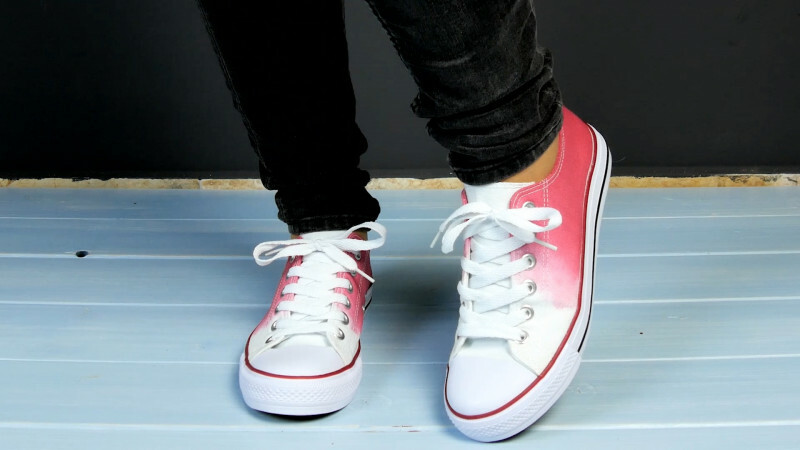 Whether you want to brighten up your sports shoes, sneakers or pumps, here are five simple DIY ideas that'll have your footwear standing out from the crowd. 1.1 The first idea for designing your own shoes works perfectly for white sports shoes. First, apply vaseline to the edge of the rubber sole. 1.2 Mix 10 tbsp salt, 1 qt water and the fabric dye. Dip the shoe into the mixture heel first, but keep the tongue away. 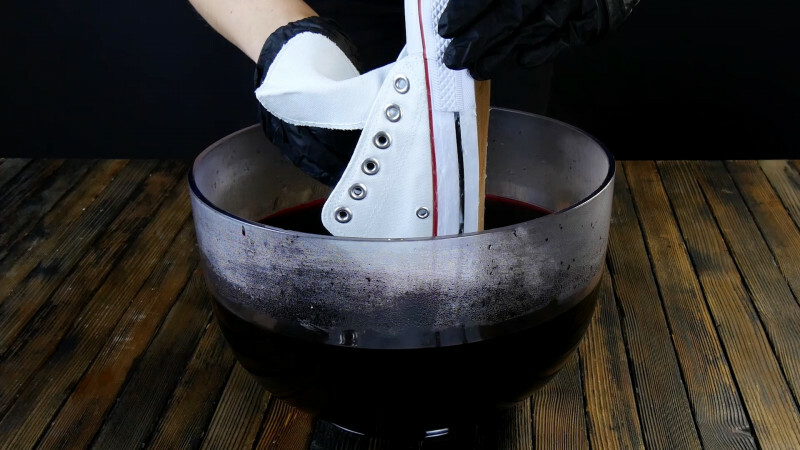 1.3 Smudge the dye with a cloth so that there's a nice color transition on the shoe. 1.4 Wipe away the vaseline. 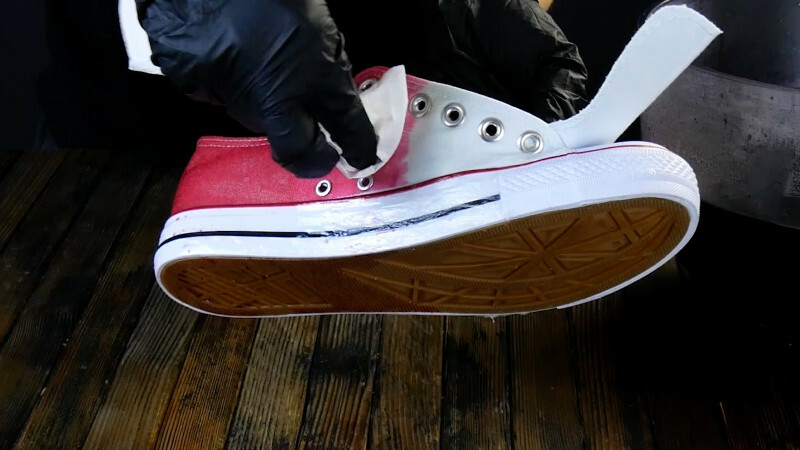 The vaseline only needs to be applied on parts of the shoe that will dipped in the dye mixture. You can now show off your new kicks out on the town. 2.1 Choose a napkin with a design you'd like to have on your shoes. First, remove the uppermost, printed layer from the rest of the napkin. 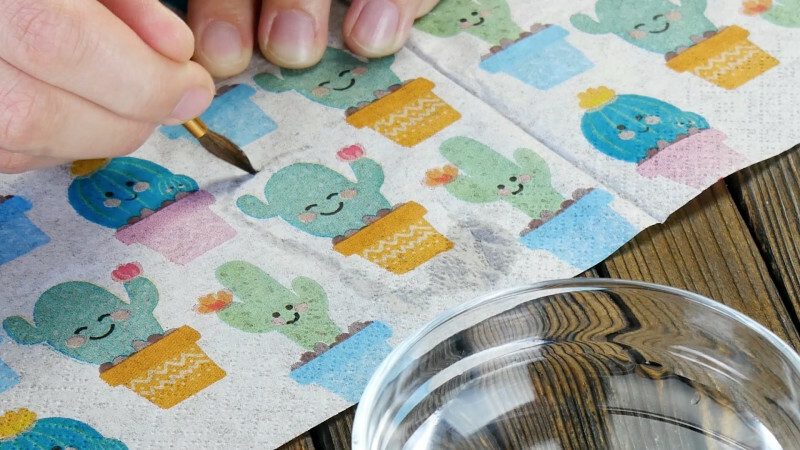 Use the paintbrush to apply some water around the motif you want. This makes it easier to tear it off from the napkin. 2.2 It's now time to stick the motif to the shoe using craft glue. Start by stuffing the shoe with tissue and pressing the motifs onto the shoe with a ball of food wrap. This prevents the napkin motif from sticking to your fingers and the shoe won't be pressed in thanks to the resistance from the tissue. 2.3 To finish, carefully apply another layer of glue. Wait until it has dried before putting your shoes back on and showing them off. 3.1 Our third trick for pimping up your shoes works best for pumps with a fabric or synthetic surface. First, stick down thin strips of Scotch tape at equal distances apart from each other. 3.2 Use the sponge paintbrush to apply paint in a color of your choice on areas that aren't covered by tape. 3.3 Remove the tape and your pumps now have a chic new look. 4.1 First, mix the craft glue with the glitter. Stuff the shoe again with tissue and place a plastic drawing template on the shoe. 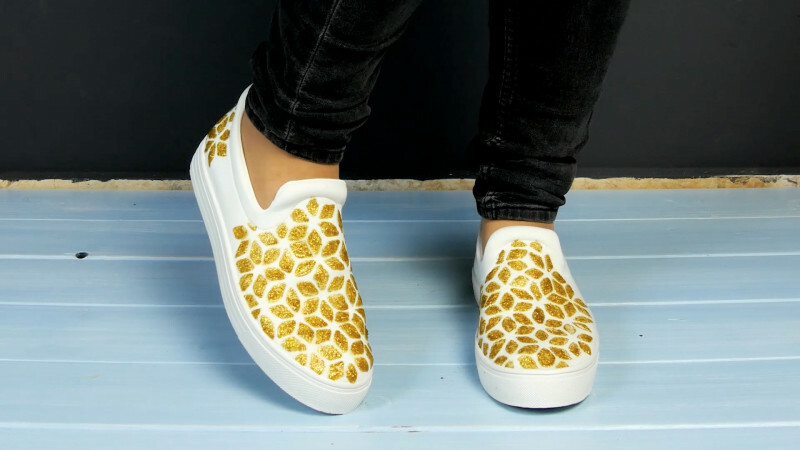 4.2 Use the template and sponge paintbrush to apply the glitter and glue mixture to the shoe. You may need an extra pair of hands to help keep the template in place. 5.1 First, cut the piece of fabric into a shape that fits onto the tongue. Spread craft glue on the front of the tongue and stick the fabric on top. 5.2 The piece of fabric should be large enough to go around to the back of the tongue so that it can be stuck down in place. 5.3 As in the example below, you can now use laces that are the same color to give the shoes a cool finish. 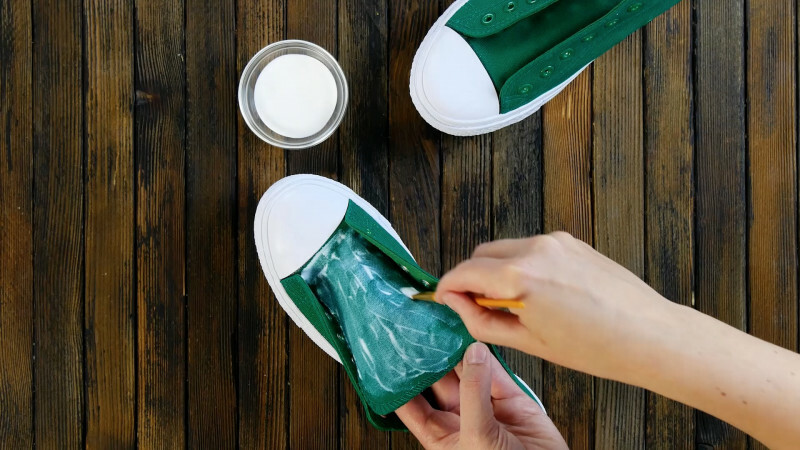 Pimping up your shoes can be so easy! 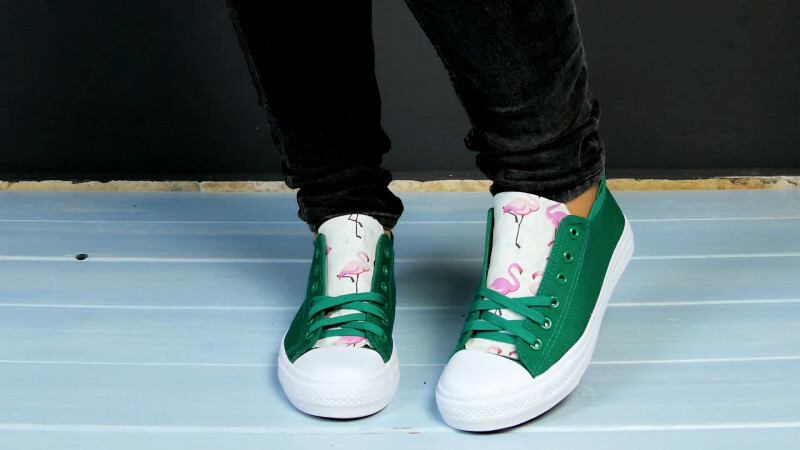 You certainly won't be able to find these chic sneakers at shoe stores. So what are you waiting for!